Panasonic is pleased to announce that its award winning DMC-GH1 interchangeable lens camera will be available to purchase as body only � offering Micro Four Thirds Lens owners a cost effective solution to using the DMC-GH1. The DMC-GH1 is a digital interchangeable lens camera system that delivers professional-level features and performance in a compact, easy-to-use camera body. The DMC-GH1 is called a CREATIVE HD HYBRID because it records not only high-quality photos but also high definition 1080/25p or smooth 720/50p HD (High Definition) movies in AVCHD format. Continuous AF can be used while recording movies, to further boost operating. 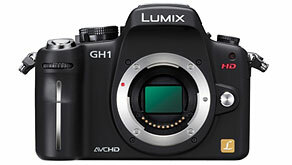 Compatible with the Micro Four Thirds System standard, the DMC-GH1 can be partnered with the many Micro Four Thirds Lenses available to offer your preferred shooting experience. To further add to its appeal, thanks to the selection of mount adapters, many different lens system users can now enjoy the DMC-GH1. Available in stylish black, the DMC-GH1 body only can be purchased in the UK from the beginning of January 2010.